The first half of 2012 paints a mixed picture of the global modern and contemporary art market. 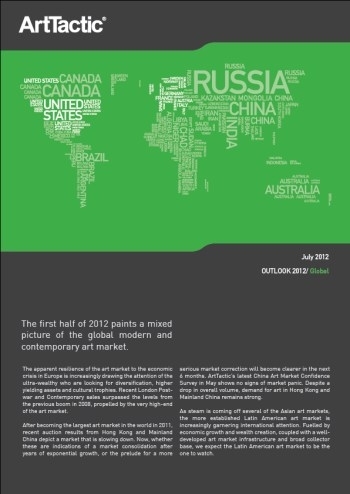 This lastest report from ArtTactic reviews the market from January to June 2012 and re-assesses the Outlook for the Global contemporary art market in the next 6 months. The apparent resilience of the art market to the economic crisis in Europe is increasingly drawing the attention of the ultra-wealthy who are looking for diversification, higher yielding assets and cultural trophies. Recent London Post-war and Contemporary sales surpassed the levels from the previous boom in 2008, propelled by the very high-end of the art market. After becoming the largest art market in the world in 2011, recent auction results from Hong Kong and Mainland China depict a market that is slowing down. Now, whether these are indications of a market consolidation after years of exponential growth, or the prelude for a more serious market correction will become clearer in the next 6 months. ArtTactic’s latest China Art Market Confidence Survey in May shows no signs of market panic. Despite a drop in overall volume, demand for art in Hong Kong and Mainland China remains strong. As steam is coming off several of the Asian art markets, the more established Latin American art market is increasingly garnering international attention. Fuelled by economic growth and wealth creation, coupled with a well-developed art market infrastructure and broad collector base, we expect the Latin American art market to be the one to watch. Markets included in this report: US & Europe, China, India, Middle-East, Latin America and Russia.